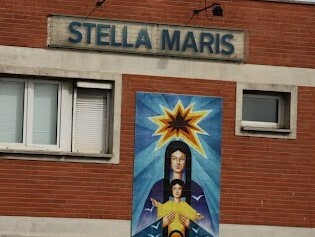 The Stella Maris Hostel in Barcelona has been running since 1927. It is an association directed to the recepetion and help for sea workers , where more than 40 volunteers work and offer their services to their guests. The Hostel consists of 32 distributed beds in 20 single rooms and 6 double rooms, at a price of €13 per night and person. It has a library and a TV room for the residents. Photo of the double room. Since Yacht Point, we only recommend it to students from outside of Barcelona to stay in this hostel. It is cheap, near the school, offers various services to boat crews and in addition to that, all students who have resided there have been very satisfied. by taxi, costs around €25. by train, take the R2 till Passeig de Gràcia, transfer and take the metro L3 (the green line) and get off in Drassanes. The ticket costs €2.15, valid for 1 hour and 15 minutes. by metro, take the L9 Sud (the ticket costs €4.50) till Zona Universitària, transfer and take the metro L3 to Drassanes. by bus (airbus), costs €6 with destination in Plaça Catalunya. You can take the metro L3 at Plaça Catalunya and get off in Drassanes. If not, go to the Ramblas by foot till Colón and then right for about 400 mtrs (as indicated on the photo). by metro to the nearest station Drassanes L3. by bus: nearest stops: 21, 121, D20, H14 and V11. To book you only have to access the website through this link.